This complicates our grasp of causality in Hamlet. Everyone knows that there's no clear explanation for why Hamlet delays, or why he decides to assume a guise of madness (in Saxo and Belleforest these matters follow logically from Amleth's situation, but not here). But Hamlet isn't alone in being resistant to explanation. Ophelia, distressed by the nunnery scene, is reasonably perky in the play scene. When we next see her she has gone mad; we can make reasonable guesses about why, but she can't tell us. Nor do we ever really know Gertrude's thoughts after the closet scene. The ghost seems to say that she was seduced before her first husband's death, but she never confirms it. Whether she really loved Claudius, and whether she now hates him, remain enigmas. Hamlet's accusation to Guildenstern - "You would play upon me, you would seem to know my stops, you would pluck out the heart of my mystery" - can be directed to us interpreters too, seeking to prise definite causalities out of an action which proceeds with a marvellous impression of naturalism but with many non-sequiturs. Why does the Ghost say that he comes "to whet thy almost blunted purpose" not before but after Hamlet has just taken steps to confirm the king's guilt, and has just killed Polonius, thinking him to be the king? Or to take a much smaller thing, why does Hamlet reduce Ophelia's "tis twice two months" to "two months"? - what chiefly strikes us is the verisimilitude; this is the slipshod way that ordinary people talk. The ethos of such a presentation is that people are weak. "Use every man after his desert, and who shall scape whipping?" That sense of vague tolerance for inevitable weakness affects even our judgment of Claudius. He wanted power and he wanted Gertrude, and he did an evil thing to attain this, but what mainly strikes us is a certain helplessness. Claudius knows that his prayers are vain - God doesn't pardon him - but I believe his soliloquy goes a long way towards winning our pardon. We see that he has a conscience. More than that, we see that restitution would be difficult and perverse, and his reluctance to give up his gains is all too understandable. He, too, is ordinary. Of course we see a more openly ruthless Claudius in the later acts, but even here our condemnation is modified, he hardly seems to exult in what he sees as self-defence; it is only the threatening and murderous Hamlet that he seeks to snuff out. Hamlet too incurs that complex forgiveability. When at the end of the play, Horatio says "Now cracks a noble heart", the judgment does not strike most of us as a moral affront, we feel it's well justified. * Few will feel that cowardice - his own self-accusation - adequately describes the natural reluctance that he feels to "sweep" to his revenge. Yet Hamlet was cruel, he indulged in misogynistic diatribes, his behaviour (in one way or another) led to Ophelia's death, he cared little for accidentally killing Polonius and not at all for deliberately sending Rosencrantz and Guildenstern to their deaths - surely a disproportionate response to their rather venial involvement in keeping tabs on him. Pure goodness isn't available here: we see that it's an effect of distance and selection. Hamlet's praise of his father doesn't shake our conviction that this war-like father likely committed a few acts in the course of his career that fully merited significant expiation in Purgatory. As for Hamlet's praise of Horatio, we feel its object squirming. Hamlet, we feel, is choosing for reasons of his own to make a great point of something he can't really know, Horatio being so much his social inferior. We believe, of course, that Horatio's a good sort, but that's a rather different thing from the moral ideal that Hamlet paints. Yet most of us* are apt to believe that Horatio's testimony about Hamlet is sound. Partly because of what we see - that Hamlet has many lovable and fine qualities - , but also because the play teaches us that we, the audience, can't see the whole of any character. While Harold Jenkins and Stephen Greenblatt have rightly praised Hamlet's dramatic advance in the depiction of inwardness, we should add that it is also a depiction of inscrutability. The more real the characters appear, the less they can be certainly known. Hamlet tells us much about himself, but we understand more of Hamlet than he is able to tell us; and at the same time we are also made aware of much that we cannot understand, and that the play will never explain. It's the same complex mixture of understanding and ignorance that characterizes our own relations with people we know. The chief objection to D.H. Lawrence, Rebecca West or Simon Critchley, is that their highly negative views of Hamlet unbalance the play. If we can't identify with and feel pity for Hamlet when he's given his terrible mission by the ghost of his father, then all the life fizzles out of this most lively of plays. "Revenge is best served cold". The motto suits Amleth, who is very different from Hamlet. It takes him years to execute his monumental revenge; years of patient steady dissimulation. He is apparently in a far more dangerous situation than Hamlet is. His pretended madness is a survival tactic. As Jenkins points out, it isn't Hamlet's "delay" that is the issue, it's his indecision and procrastination. Delay is fine, so long as you have a definite plan, like Amleth does. In Saxo, the story of Amleth's revenge is only the first part of Amleth's story. He survives to pursue other stories in England and Scotland, finally suffering a violent death himself. The narrative therefore has the distanced effect of a chronicle, somewhat like the story of Lear and his daughters as told by Spenser. The Ur-Hamlet is a lost play that already existed in 1589. Harold Jenkins argues persuasively that it was written by Kyd and preceded The Spanish Tragedy. 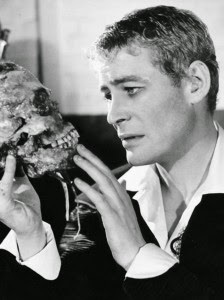 I've always assumed that the plot-transformation by which the murder of Hamlet's father becomes a secret must have already occurred in the Ur-Hamlet, because almost the only thing we know about it is that it had a ghost who cried "Hamlet, revenge!". Jenkins points out that this is an assumption. Yet it's a natural one. Surely the Ghost must be Ur-Hamlet's father. But if Ur-Hamlet already knew that his uncle had killed his father (as Amleth did), there would be no dramatic need to bring in a ghost to urge what he must already have proposed to himself. The ghost might, of course, have been just an incidental sensation; but Lodge's allusion suggests that the ghost was memorable. Marston's play, which can be precisely dated to winter 1600-01. Jenkins convincingly shows that it borrowed from Shakespeare's Hamlet , therefore confirming the date of the latter to be 1600 (or possibly, very late 1599). With the corollary, that the material about the "little eyasses" (children's companies such as Marston's) was a later topical interpolation into a play that already existed - a very unusual thing for Shakespeare. Above, the 1921 Malone Society reprint of Antonio and Mellida and Antonio's Revenge . The text version is like reading subtitles through a snowstorm. Read the PDF instead. I am so boundless happy. Doth she come? By this warm reeking gore, I'll marry her. Look I not now like an Inamorate? Poison the father, butcher the son, and marry the mother, ha? This is a splendid essay so far as it expresses very clearly the question about Hamlet's madness; i.e. that it's necessary to Amleth but perverse for Hamlet; that it's insufficiently motivated once the murder is transformed into a secret murder. You can appreciate the connection that Greenblatt makes between the unmotivated madness and the new drama of inwardness without having to go all the way with him on his theory that the play has deep connections with the death of Shakespeare's son Hamnet in 1596. This was an idea that Greenblatt presumably developed from Ulysses; he extravagantly admires the biographical speculation of Stephen Dedalus and his pals in "Scylla and Charybdis"; just as they admire Wilde's "Portrait of Mr W.H."